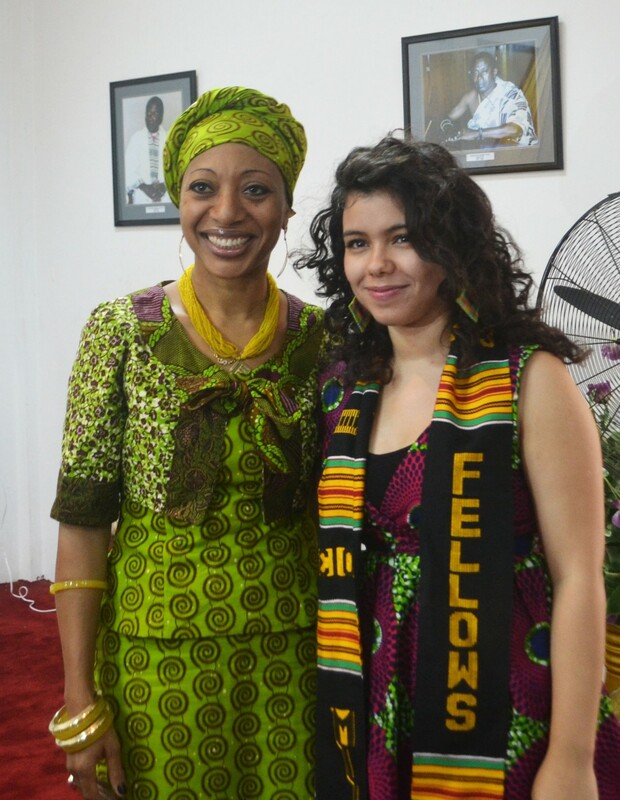 Aya Chebbi has most recently been named as one of 28 Africa's most promising young women leaders by Moremi Initiative Leadership and Empowerment Development (MILEAD) fellows Institute– 25 from across Africa and three from the diaspora. For this highly prestigious award conferred on African women, Aya was chosen as the sole representative of Tunisia, her home country and the only Tunisian recognized by the institute since the MILEAD Awards were established in 2004. The 2013 selected African leaders are women who have shown the promise, courage and commitment to lead and shape the future of Africa. They were chosen through a highly competitive selection process and criteria based on their outstanding leadership promise, community service accomplishments, and commitment to the advancement of women in Africa. They are also recognized as "already actively leading change on pertinent issues, both at the grassroots and international level with multi-disciplinary academic, professional and social backgrounds. From poverty to women’s economic empowerment, environmental justice and political participation, this new generation of African women leaders are proof that Africa can produce the bold, visionary and inspirational leadership needed to lift Africa to its rightful place on the global stage.” said a news release from the Moremi Institute. Following this recognition, the Moremi Institute provides a year long-term leadership development program designed to develop and promote these emerging young African women leaders to attain and thrive in leadership roles in their communities and Africa as a whole. Aya was then invited to take part in an intensive three week leadership course held in Ghana and hosted by the Institute of African Studies, University of Ghana. The intensive course served as a platform for the fellows to cross-examine concepts of leadership in a broad African context, cultivate skills necessary to occupy and excel in leadership positions and exchange experiences and knowledge on cutting-edge issues critical to African women and their communities. 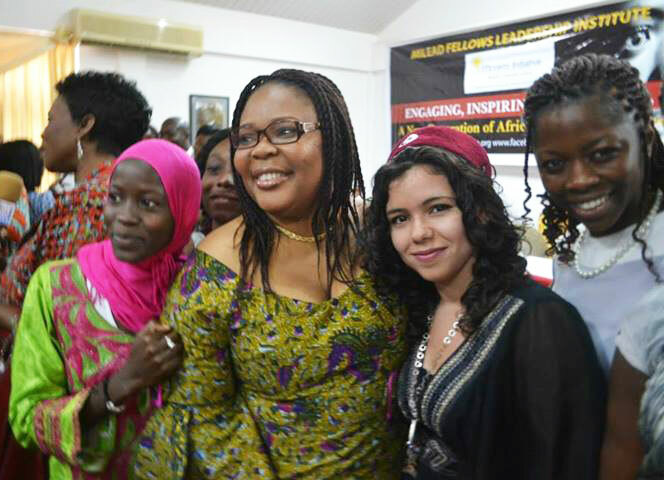 During her Accra trip, Aya had the honor to meet with the Nobel Peace Price Laureate Ms. Leymah Gbowee, member of Ghana Parliament Hon.Sarah Adwoa Safo, Ms.Esther Cobbah, Ms.Hendrica Okondo, Dr Juliette M. Tuakli among other inspirational African women leaders. She also received her award from Hon. Samia Nkrumah, the daughter of the first president of Ghana and chairperson of the Convention Peoples Party. Following their meeting in Ghana, Fellows will be mentored by experienced and recognized women leaders who are committed to supporting and nurturing the next generation of African women leaders. Along with the other fellows, Aya will also be supported by the Moremi institute to implement her project that benefits women and girls in Africa through career planning, management, and access to opportunities and resources. 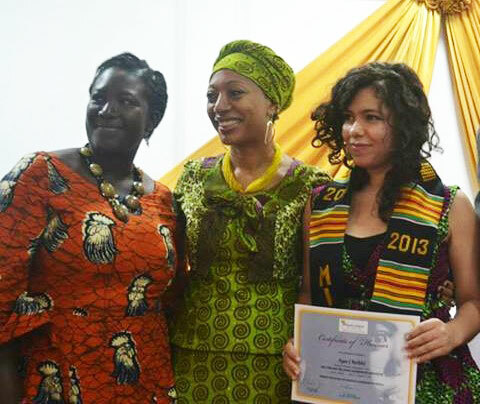 A statement issued by Moremi Institute for Women’s Leadership in Africa noted that Ms. Aya Chebbi was selected for her outstanding achievements as women's advocate and peace activist with a passion to unite African youth for Africa's development. Here is the expression about her feeling. "I live with the motto that 'only a life lived for others is a life worthwhile' and with this in mind I could fully engage in community service in different fields affecting the lives of different people as a Tunisian and global citizen. However, I started being mindful of what I'm doing the day I started inner peace practice.I started being mindful of my time, my work, my words, my actions... and it helped me develop myself and be more productive, efficient and focused but most importantly more compassionate especially working with women traumatized by violence, unprivileged children with disabilities and even addressing sensitive issues during my work as Peer Educator on HIV/AIDS. Besides, growing up with the images of Israeli-Palestinan conflict, witnessing the Arab uprising, Libya's civil war, looking up at all the conflicts in my continent, living in peace has always been a dream to attain. I could see peace possible only from the lens of negotiations and mediation in the hands of decision-makers which underestimated my role as a citizen in the peace process of all the conflicts around me.Then, I found out that peace starts within each one of us just like the change we seek in society starts from each citizen because this is what forms a society. It's not only about mediation but meditation! it's not only about being in peace with others but first with ourselves! attaining inner-happiness gives me the strength to smile everyday, to start my new day, new mission and give back to my community. I feel so honored to be recognized as Outstanding Young Leader. I believe anyone can excel in their work and be "outstanding leaders" if they have three keys: Passion, Faith and Inner Peace."